I blogged a few days back about 'the name game' preferring a new name for the new team rather than recycling something from the past. Marketers seem to feel that teams need mean sounding names and an angry looking logo to be a success (actually, my favourite Winnipeg team name of the past: The Winnipeg Fury). 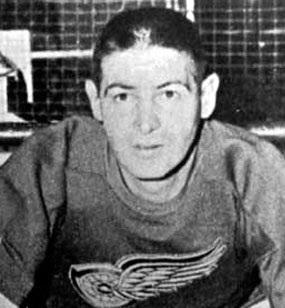 The Sawchuks: Yesterday’s announcement coincided with the 41st anniversary of the death of Winnipeg's Terry Sawchuk, considered by many to be the NHL's finest goalie. Sadly, his life was cut short at the age of 40 or he may have been around to see this day. You could make a pretty nifty logo from Sawchuck ! The Jetsons: Combining the two most successful Winnipeg hockey franchises (the Olympic Gold medal winning Winnipeg Falcons and WHA's multi-AVCO Winning Jets). Nothing: Back in the day (20s, 30s) there was a sports club named the Winnipeg Athletic Club. They fielded teams in hockey, track, basketball, rugby and had a great deal of success playing for Dominion championships, Olympic gold medals and Grey Cups. 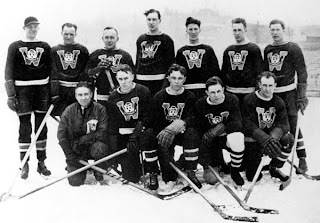 The teams never did have a name or a logo.They were simply the Winnipegs (nicknamed the 'Pegs) and used a W, sometimes with the gates from the city crest. 'Winnipeg' does have a panache to it. I blogged long ago about the use of Winnipeg elsewhere the world to market everything from purses to camper vans to high-end mirrors. Maybe go with Winnipeg for now and take time to have a proper naming contest ! Who knows, the W might stick ! The Golden Jets: Not my creation but someone at work said they heard this trotted out somewhere in the mediasphere last night. It's not a very 'tough' name but it allows people who won't call them anything but Jets to still do so, perhaps even use part of the old logo. It pays homage to probably the greatest Jet Bobby Hull. The gold can also be a tied in with wheat. That would allow for a "Manitoba" designation rather than a Winnipeg which I do hope they do. I'm thinking the "Winnipeg Phoenix" would be appropriate. Rising from the ashes financial disaster in the southern U.S., the name would also thumb a nose at the Coyotes management. Good logo possibilities come with a fierce looking bird surrounded by flames! How about the "Winnipeg Heat"? :) I think it makes sense to keep "Winnipeg" as part of the new team name and identity. I don't see the current NHL team names and identity being very catchy with: "Alberta Flames" "Alberta Oilers" British Columbia Canucks, Ontario Maple Leafs, or Quebec Canadiens (Wooo, can you imagine??) and on and on. It's all about Marketing and an emotional connection and the Winnipeg and Jets name again will sell lots of tickets, plus merchandise etc. And out of a million people in the province, 750,000 people live in the "peg. My 2 cents. If you live in Brandon, I"m sure you will still drive into see a game! Tough names are overrated. The Red Wings are a great example: great name and great logo, with nothing tough about it. It should roll off the tongue nicely (Manitoba Polar Bears does NOT do this) and have some relevance ideally .. in my mind.